You want to build a complete business website without writing a single line of code. You are using WordPress to build your business’s website. You are looking for a premium website template to showcase your restaurant, coffee shop, bakery, catering service, cafeteria, or any other food business. You want to start a food delivery website where people can look at the menu and order directly from the website. You are new to web development and want to create and customize your website easily without writing a single line of code. Your client wants a beautiful, easy-to-use, and lead generating food service website in less time. 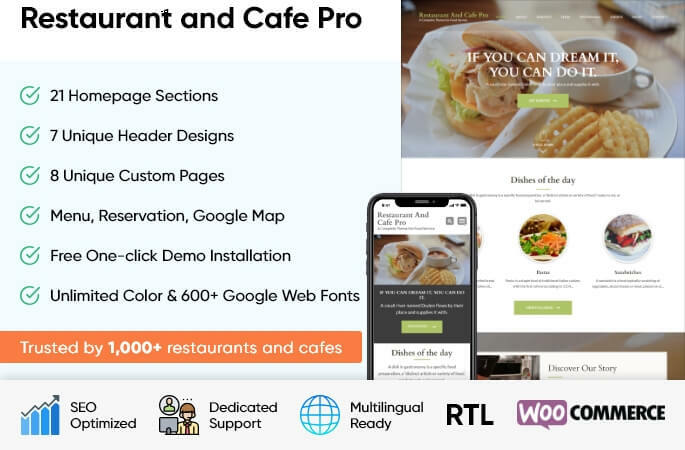 You can import all the images, text, and settings from the live demo of Restaurant and Cafe Pro theme with a click for free because we believe you should spend more time on your venture than on setting up your website. More than 50% Google searches are done on mobile devices. Restaurant and Cafe Pro is a fully responsive mobile friendly WordPress theme. 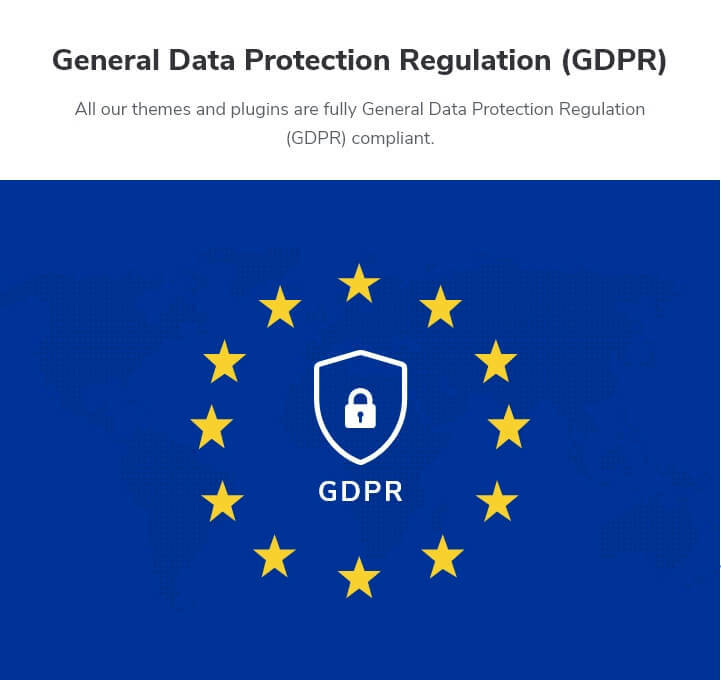 The theme automatically adjusts itself to screen sizes of various mobile devices and tablets so that your website looks flawless on every device and offers smooth user experience. You can reach a wide range of customers with the fully responsive design. Restaurant and Cafe Pro WordPress theme passes Google mobile-friendly test. This means better rankings in search results. You can display Video, Image, or Slider on the banner section of the Restaurant and Cafe Pro theme. For video, you can upload it to your website or embed it from Youtube. For the image, you can add a single image or randomize multiple images. For Slider, you can use Post, Category, or Custom Fields and adjust the speed and animation. Restaurant and Cafe Pro offers 21 sections on the front page that can be enabled or disabled with a click. With so many sections, you can display everything about your business right on the homepage. Restaurant and Cafe Pro comes with an Advertisement widget so that you can easily place ads on the sidebars and make more money from your blog. This widget lets you add an ad code or a custom image with a link. With 7 Header Layouts Option on Restaurant and Cafe Pro, you can customize and create a unique website with a simple click. Restaurant and Cafe Pro comes with 8 pre-built custom pages that include about page, contact page, events page, gallery page, restaurant menu page, services page, team page, and testimonials page. These pages will help you make your website truly unique and organized. You can easily manage events, team members, and testimonials with the custom post types. These 3 custom posts types will help you organize your website’s posts. You can easily create a professional looking One Page website using Restaurant and Cafe Pro theme. Your visitors can easily access everything they need right from the home page. Search engines will fall in love with business’s website. Restaurant and Cafe Pro WordPress theme is a speed optimized WordPress theme, which means your website will load faster and your visitors will have a smooth browsing experience. The theme, with its speed, will help you keep your customers and get new leads easily. Restaurant and Cafe Pro allows you to display your social media links on your website so that your visitors can find you on social media. Social media on your website will also help you boost your business’ engagement. The theme also supports Russian and Chinese social media like OK, VK, Zing, and others. You can add unlimited social media to your website. Restaurant and Cafe Pro features a powerful options panel that allows you to easily customize and configure your themes. You can easily edit, add or remove any section from your Footer on Restaurant and Cafe Pro. Blogs are a great way to attract new website visitors and built trust. Restaurant and Cafe Pro has beautifully designed blog layout for your blog posts. Restaurant and Cafe Pro is cross-browser compatible so that all of its features work in Chrome, Firefox, Edge, and Safari. Have more control over your listing Page display with an option to change Excerpt Length and Read More Text. Restaurant and Cafe Pro supports Right to Left scripts so that various types of languages will be displayed properly on your website. Simply add a translation file and your site will be translated into your preferred languages with the Restaurant and Cafe Pro translation ready feature. Restaurant and Cafe Pro is WooCommerce Plugin ready. So you have got everything you need to start a powerful online store and manage it like a boss. Help search engines and ease navigation for an ultimate user experience on your website with the help of breadcrumbs included in Restaurant and Cafe Pro. The text and design of the Restaurant and Cafe Pro are optimized for readability with structured sizing, great contrast, and ample spacing. Restaurant and Cafe Pro utilizes only the best practices for code implementation, which improves performance, security, and makes it very easy for you to customize if needed. We have included extensive documentation to help you understand how to use Restaurant and Cafe Pro and customize it as you desire.